The Export to QuickTime Movie dialog box lets you export your animation as a QuickTime movie. If you want to render a QuickTime movie with lossless compression and transparency, you can use the Animation video codec with the colour depth set to Millions of Colours +. Lets you select a folder in which to save your movie and give it a file name for the export. Exports the entire frame range. Lets you enter the frame range to export. Lets you select a resolution ratio. If you select Custom, you can enter the width and height. 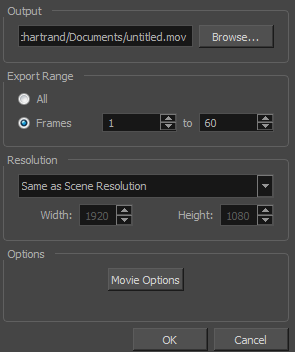 Lets you specify the width and height of the resolution. Opens the Movie Settings dialog box in which you can set the the compression settings for the movie you will export—see Movie Settings Dialog Box.